Now get out there and behold it! Hiking/swimming note: Wear rubber soled shoes you don’t mind getting dirty. For swimming, wear your swimsuit under hiking clothes, bring a small towel and for comfort have foot covering to wear while swimming as getting into plunge pools can involve walking on rocks – smooth ones, but rocks just the same. Drive north on University Avenue. (CAUTION: obey the 25 MPH speed limit at all times on campus. They mean it.) 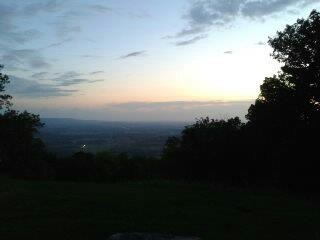 Take a left turn at Green’s View Rd (Sewanee Inn is on the corner) and follow to the end. A splendid view off the plateau. In the foreground are the forests of Shakerag Hollow and Roarks Cove. In the distance are fields, hills and woods. See it in the day time and come back at night, dowse your car lights and view the stars displayed through clear air. Sit quietly on a rock and listen to the chorus to tree frogs. If you want to stroll a bit by day, take the bluff-top path in either direction. It is part of the Perimeter Trail that surrounds the plateau portion of the Domain and runs for 20 miles. A map of the trail can be obtained at the campus book store. From University Ave turn right on Tennessee Ave. Follow to end. An overlook off the bluff looking West to surrounding countryside far below. 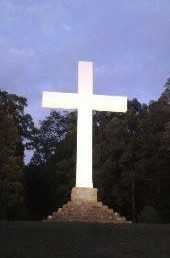 The cross is a war memorial, its light visible for many miles at night. The view is very good, though limited by surrounding trees. The Perimeter Trail is available in either direction from here, and information posted at the trailhead to the right to the cross (facing out) can guide you to a short stroll, or with proper footwear, to some more ambitious ones. Directions: Turn onto Hwy 56. Watch on left at about 2 miles for sign for Sewanee Natural Bridge State Natural Area. The Natural Bridge spans about 50 feet and is 27 feet high. From its top you view Lost Cove and the bluff behind has several deep overhangs. Directions: From University Avenue (the main drag), look for the entrance sign to the trail on your right in a wooded area between Texas Avenue and South Carolina Avenue. The gardens of Abbo’s Alley follow a spring-fed stream that cuts through the campus. The flora is a combination of cultivated and indigenous trees, shrubs and plants with the emphasis on keeping the natural flow of the land. It is a perfect place to find solitude and quiet to accompany a brisk stroll or leisurely amble. Directions: From Sewanee turn left onto Hwy 41A. In Monteagle, follow Hwy 41. Visitor center is well marked 2.5 miles on left. Excellent exhibits on natural history and features of area. Videos of Park available to view. Friendly park personnel will answer questions. Delightful nature trail on grounds (see below). Distance from Sewanee and Directions: See above. Marked nature trail through gently rolling terrain. Choose 1 mile or 2 mile loop. Get map at Visitor Center. Trails are closed at dark. ​Directions: Turn left from Sewanee onto Hwy 41A and drive to Monteagle. Join Hwy 41 through Tracy City, continuing on Hwy 41 for another 7.6 miles. Watch on the right for small sign indicating turn-off for Foster Falls Small Wild Area. Follow the access road straight ahead to the parking area near the large pavilion. This is a beautiful 60ft waterfall which tumbles into a 120 ft wide sandstone plunge basin. Its watershed is small, so the amount of water flow depends on how recently rain has fallen. The 125yd trail from the parking lot to the cliff top is paved and bridged, ending in a raised walkway and deck which offers a fine view of the falls. To obtain a spectacular view of falls and pool, take cliff top trail to right (falls will be on your left) and follow Fiery Gizzard Trail upstream, over the bridge across the stream which feeds the falls and through woods to where it opens onto the cliff-top high above the falls. Treat yourself to a sit-down on cliff edge. If you can spare another few minutes, continue on this trail to enjoy views of Fiery Gizzard gulf. Retrace your steps to parking lot. To swim at base of Falls: From the parking lot follow the wooden bridge and decking to the right along the cliff top and then follow signs to “Base of Falls”. This is a steep, zigzag trail, strenuous but not long – and regularly negotiated by small children. Hiking Distance: 2 mile loop Hiking Time: 40-60 min. For swimming, add 30 min. Directions: From Sewanee, turn left onto Hwy 41A, then in Monteagle, left onto Hwy 41 and travel 4.7 miles, passing the South Cumberland State Recreation Area Visitor Center. Watch on right for modest sign for Grundy Forest Natural Area Fiery Gizzard Trail. Follow signs to overnight parking area and continue to parking within picnic area. Signed trail begins to right of large picnic shelter. This is an exceptionally beautiful loop trail down Gizzard Cove, along Big and Little Fiery Gizzard Creeks. The vegetation is outstanding, being typical of elevations much higher – laurel, wild flowers, and huge hemlocks. At 1.3 miles you’ll pass a bridge to the right that is the beginning of the Fiery Gizzard Trail – stay on your own trail straight ahead. At 1.5 miles you’ll come to Blue Hole Falls, a 9ft drop with a nice swimming hole under. At 1.8 miles the trail passes under a huge rock overhang known as Cave Spring Rock house, and the 500 year old hemlocks that stand near it. The trail will switch left up the bluff and return to the parking lot. Directions: From Sewanee, turn left onto Hwy 41A, then in Monteagle turn left on Hwy 41. Pass the South Cumberland State Recreation Area Visitor Center and watch on right for a modest sign to “Grundy Forest Natural Area Fiery Gizzard Trail”. Follow signs to parking in picnic area. Trail head is to the left of large picnic shelter and is marked by wooden sign showing distances on the Fiery Gizzard Trail. Sycamore Falls and Hole is a 12 foot high, broad waterfall plunging into a secluded, deep pool surrounded by high sandstone walls. Access is by Fiery Gizzard Trail which then continues on another 11 miles through a heavily forested gorge available to overnight backpackers. From the parking lot take the trail to the left of the picnic shelter (sign lists distances to several overnight backpacking campsites via Fiery Gizzard Trail). The trail soon drops over the bluff and under Cave Spring Rock house, a huge rock overhang. The hemlock trees here are immense, having been spared lumbering when that was a primary industry in the area. They are estimated to be at least 500 years old. Vegetation is atypical to this altitude, being more often found several thousand feet higher. Little Fiery Gizzard Creek will be on your left. At 0.7 miles you will take a bridge to the left over the creek, being now on Fiery Gizzard Trail and with the creek on your right. Soon Big Fiery Gizzard Creek joins in and “Black Canyon”, a deeply cut slot through which the confluent waters plummet, will appear on your right. (You’ll have to walk off the trail a few yards and peer over the edge.) Beyond, at about 1.2 miles on your trip, five Chimney Rocks stand in the forest to your right. The trail bends around these and a small sign points to the head of the Falls. To view the Falls from the plunge pool and to swim, take the lower trail at the aforementioned sign and follow the creek upstream toward the Falls. It is necessary to ford the stream to reach the pool. Enjoy. This is a wonderful spot you may have all to yourself. Swim out to the rock shelf behind the falls. Return to the parking lot by retracing your route. Directions: From Sewanee, turn left onto Hwy 41A, then in Monteagle turn left on Hwy 41. In Tracy City, (5.5 miles) turn left on Hwy 56. Pass through Coalmont, Altamont and Beersheba Springs. Watch for sign on right which marks road to Savage Gulf State Natural Area and Stone Door. Parking and the ranger station are 1.5 miles down this road. This is a must if you can spare a few hours! Designated a National Natural Landmark, the cliff-top views into Savage Gulf many hundreds of feet below are superb. Trails are broad and easy. Military fighter jets have been known to course through the Gulf, BELOW the cliff-tops. If time allows, follow the trail a bit further and see Stone Door, a natural cleft in the cliffs that has been used for thousands of years to gain access to the bottom of Savage Gulf. Return to parking lot by retracing the trail you used to hike in. Directions: From Sewanee, turn left onto Hwy 41A, then in Monteagle, turn left onto Hwy 41 and travel to Tracy City (5.5miles) Turn left on Hwy 56 and pass through Coalmont and Altamont. Just past Altamont, the road dips and twists through a ravine and over a bridge. As it rises again and bends right, look to the right for a sign to Greeter Falls. (NOT an earlier sign to a subdivision named for the falls.) Turn and follow this road 0.7 miles to Greeter Falls parking lot. Trail begins at gated dirt road on other side of the paved road you came in on. Follow signs to Greeter Falls. Greeter is formed by Firescald Creek dropping 50 feet into a huge plunge pool. As the marked trail approaches the falls, it splits right and left, with the upper falls 100 yards to the right and the lower falls 0.1 mile to the left where a spiral staircase (really!) takes you down the bluff into Greeter’s amphitheater. The first view of the falls is always a fresh delight. With improved access Greeter has become the swimming hole for summer camps and assorted groups so it will not seem as much like wilderness as was formerly the case. It is still well worth visiting and enjoying the cold, clear water and movie-set surroundings. Swim out to the falls, stand on the rock shelf just under water and find out what a drop of water from 50 feet above feels like! Follow the directions for Greeter Falls (above). From the parking lot, walk down the gated dirt road as though going to the falls, but watch on your right for a sign to Blue Hole and follow that trail 0.5 miles to the pool. This is a great swimming hole near where Longs Mill stood many years ago at the juncture of Piney Creek and Firescald Creek. Here Firescald Creek makes a cascading slide over smooth rock formations into a pool 10 to 20 feet deep. Trail winds through lovely young hardwood forest with many hemlock trees and mountain laurel. Easy going until the last 50 ft. which requires negotiating a rocky hillside. Follow downstream to rocks bordering a deep swimming hole. Much less “improved” than Greeter Falls with a quieter and wilder feeling. Directions: From Sewanee turn left onto Hwy 41A, then in Monteagle, turn left onto Hwy 41 and proceed to Tracy City (5.5miles). Follow Hwy 41 through Tracy City and shortly after leaving the downtown area, watch for Lake Road on ft. (There is a sign for Grundy Lakes and a Dollar General store on right). Turn left onto Lake Road and travel 0.5 mile to South Cumberland State Recreation Area – Grundy Lakes. The parking lot is to the left at the beach area. Walk across the road to see the old Coke Ovens which placed Grundy Lakes on the National Register of Historic Places. (No, not that kind of coke, but rather the coke made from coal mined in the area that was then used to make steel.) You may swim at the beach adjacent to the parking lot, or hike the 1.25 mile Lone Rock trail. Lone Rock Trail Head is to your right as you face the lake from the parking area. Walk the single-lane road along the lake shore to marked trail head which crosses the stream on an arched bridge. The trail wends its way along the wooded lake shore, up a moderate hillside and across the dam. At this point you may choose between continuing on the lakeside woods trail to the left or take a yellow-lined pedestrian way on a single-lane roadway to your right. They both eventually come out at the same place. After the woods trail and roadway rejoin, watch across the road on the right for a trail marker. This trail ambles along below the road level with a hill side on right. As a boardwalk takes you over a boggy spot, you will see on the left more of the old Coke Ovens. Crossing the road, you are back to the Lone Rock Trail Head with the parking lot to your left, where, being a prudent hiker you have access to those cool beverages waiting in your car! Alternative: If you would like a nice spot to picnic by the lake, drive along the park’s entrance road past the beach area’s parking lot. Keep a sharp look to the left for a one lane, one-way-only road across from a small lake. Turn up here and select one of a number of lakeside picnic tables.